An Edinburgh tourist guide that covers smart tips about the restaurants and shopping spots as well as recommendations for accommodation and attractions. There are two ways to understand whether you are a witch or not. They throw you into the pond. If you get drowned, you are absolved of being a witch. If you do not get drowned, then you are a witch and you need to be burned to death. Witches, be away from this city but ordinary mortals come on in because Edinburgh is way too impressive for you! Through the clouds and the cold breeze Edinburgh Castle is appeared with all its splendor and indicates that it is just the beginning of what you will see in this magical city. Undoubtedly, having the most beautiful architecture in Europe, Edinburgh strikes you with its stunning Gothic buildings, vivacious historical texture and the mesmerizing countryside. Considered as the Athens of north, Edinburgh has so much to give you in the name of history, culture and literature. Every corner of this city bears a myth, a story or a memory. This gloomy weather of Edinburgh and the gothic setting have been the inspiration of many artworks not for nothing. Edinburgh, the city of festivals, castles, whiskey, pipes, ghost stories, witch myths and world famous pubs is here to make you experience the real Scottish. It is located in the eastern coast of Scotland and in the southern shore of the Firth of Forth. Edinburgh Airport is located 12 km (8 miles) from the city center. For the transportation alternatives from airport to the city center, you can visit the airport’s official website. Being the address of the 5000 years of remains and the famous Edinburgh Castle, Old Town is undoubtedly the most touristic landmark in the city. Along with the castle, there are many gates, fabulous Holyrood Park, volcanic hill Arthur’s Seat and the Irish neighborhood Cowgate to visit in this area. The most iconic landmark of the city, and of the most famous tourist attractions in UK, Edinburgh Castle deserves at least 3 hours to internalize. 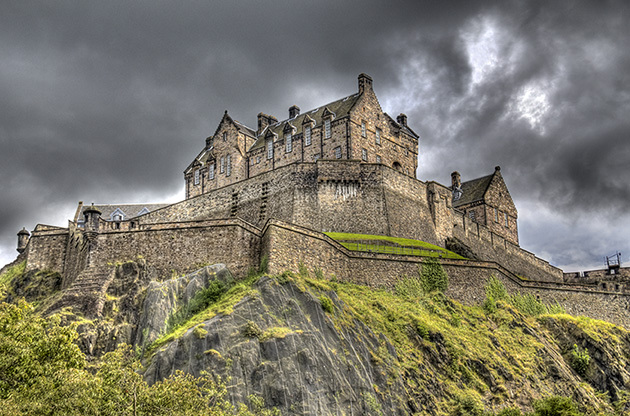 Offering a thrilling scenery thanks to its location, Edinburgh Castle will give you the epitome of Edinburgh and Scotland history. Do not forget to visit the Whiskey Museum on your way out of the castle. Known for being the café where J.K Rowling wrote her reputable novel Harry Potter, Elephant House is now a famous tourist attraction both for its inspirational side and delicious rich menu. Mentioned Dan Brown’s famous novel The Da Vinci Code, Rosslyn Chapel gained much more attention and makes everyone fall in love with itself with its magnificence. Princes Street is where heart of shopping in the city beats. Many famous brands of UK has a store in this street and it is always very populous. Georges Street is where you find fashionable boutiques, designer’s stores, world famous brands and jewelry stores. Starting from Edinburgh Castle, Royal Mile is like an open air museum and offers many iconic things to buy. One cannot think of any better place for souvenir shopping. Folk and jazz music is highly popular in this city and local people socialize in the pubs listening to live folk music. Are you looking for some Scottish dance shows? Princes and Georges Street are the places. The city of festivals, Edinburgh offers the greatest and the most popular festivals in UK. If you are in this city in summer, you will have difficulty choosing which one you will go. Among these festivals we can name International Film Festival, Television Festival, Jazz & Blues Festival and Book Festival. Located in Royal Mile, Wedgewood offers you an unforgettable dining experience surrounded by a historic spirit of old town. The Grain Store is where you can pick for the best Scottish fish and meat. A perfect ambiance with moody lighting and brick walls is a plus. Describing their menu as a combination of seasonal Scottish flavors in brasserie-influenced dishes, The Honours is one of the most elegant dining spots in the city. The hill of Corstorphine is one of the seven hills that is formed by the melting of the glaciers. You can visit The Zoo and watch the penguin parade. Need to remind you that Corstorphine is only 5 km away from Princes Street. Located only 1 km away from Princes Street, Dean Village is inside yet outside of the city thanks to its vast green fields and picturesque architecture. Scottish National Gallery of Modern Art will add up to your joy in Dean Village with the artworks of Beckmann, Matisse, Miro, Magritte and Picasso. Leith is mostly known for its richness is gastronomy and shopping. The famous Royal Yacht Britannia is anchored in the port of Leith and the dining hall, engine room and the bridge is open to visitors. The most popular conference city in UK after London, Edinburgh owes its popularity to world-class hotels, venues (one of which is award winning Edinburgh International Conference Center), the perfect transportation system and its easily reachable international airport. The capital city of festivals and cultural activities along with its historic setting creates a perfect atmosphere for inspirational global events. It provides the delegates with perfect restaurants, social attractions and a splendid texture of the city. Experienced as the host city of 49th NATO Conference, International Routes Conference and MTV Europe Music Awards 2003, the pride and joy of UK, this city is always ready to organize large scale, international events like symposiums, tradeshows, fairs, exhibitions, congresses and conferences.